Who today hasn’t heard of Facebook? Facebook has now become the number one social network in the world and it has 665 million active users on average each day as was recorded on March 31st 2015 and disclosed by Facebook. Every month, around 751 million people use Facebook from mobile devices alone. It has over 1.23 billion active users and is valued at $104 billion. And that’s just Facebook! There’s Twitter, LinkedIn, Instagram, and many other social networks to consider too. But what’s all this got to do with WordPress, you might be wondering? An Incentive For You To Start Your Own Social Network? Looking at the above figures, it definitely should make you feel motivated to start your own social network. Whether that’s to dream big and get to the size of Facebook and the others, or simply to provide a network for your friendship, business, or volunteer group. The good news is that you don’t need to study to become a coding expert and neither do you need to have any technical skills if you want to start your own social network. You can start a really cool one all on your own, just by using the fantastic CMS that is WordPress. WordPress is so simple to use, everyone from your neighbor in their 60s to your teenage niece are now using it to showcase their hobbies and also to start their own business ventures. You can easily create an interactive social network site, loaded with all kinds of features that you would see on existing ones. To build a social network yourself, there are only really four WordPress plugins that you need to consider. They’re easy to use, can be set up in no time, and are awesome! WP Symposium is a great alternative to using the BuddyPress plugin to build your WordPress social networking site. Also, the support that you get with WP Symposium is fantastic. Not only does the plugin have a very strong support community, it also has an expert Help Desk. Plus, there is a very helpful Wiki and support given for other plugins like Facebook Connect, Events, Gallery, Groups, and Mobile. Do You Want a Multi-Lingual Social Networking Website? If you plan on having a WordPress social network website that’s multi-lingual, you’ll find that WP Symposium can help. There are options available that allow you to change the text that your members will see. And if you happen to be using the WPML (WordPress Multilingual) plugin, WP Symposium works very well with that too. This is your very own social network site that you’re building and as such, you’ll probably want things to look just the way you want them to. This plugin makes customizing aspects of your site to meet your needs really easy, without having any technical knowledge at all. Button labels, text, layout, or just about anything you want changed to the way you want it to look – you can do it all with ease, with the power of WP Symposium. Plus with the Pro version, there are lots of shortcodes with different options available. WP Symposium is very compatible with various plugins and themes. Also, when you use the Pro version, there are various additional plugins available to enhance the looks and the features of your WordPress social network website. 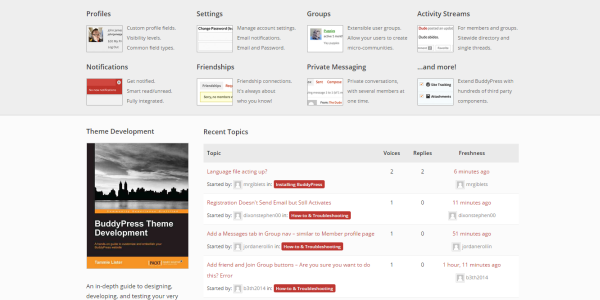 Friends, profiles, groups, wall activity, private messaging, unlimited forums, email alerts, forum subscriptions, galleries, profile security, YouTube attachments, image attachments, chat lounge, choosing who to share activity with, and loads of other features all add up to making WP Symposium a great choice. Build your social network for interest groups, a college community, a school hangout, a membership-based club, a dating portal, or a gaming community. Build a social site around whatever niche you want. Whether you have a hobby and you would like to unite with and talk to other people who share your hobby, or you want to build a worldwide social networking website for people to share news reports from all over the world; there’s the option to do so with this plugin. A very big plus to using WP Symposium is that it can be used with your current WordPress theme, so it’ll feel as though it’s part and parcel of your existing site. Is WP Symposium Right For You? Many plugins available today make you wait for long periods of time between major releases and bug fixes. But if you’d prefer frequent updates then WP Symposium is perfect. WP Symposium has been labeled as “the ultimate social network plugin for WordPress.” So go for this plugin to start creating the hottest social network of the future, all on your own. This is another cool, free plugin that will allow you to build a superior social network site – just by using WordPress. When you use WP Mingle, your users won’t see the Admin part or the WordPress login screen; it’ll look like a separate, non-WordPress social networking site. If you want your WordPress social network to be exclusive, you can do this too. The WP Mingle plugin has a premium membership option available and this works with Affiliate Royale and Wishlist Member. Also, setting up the plugin is a breeze. There are step-by-step instructions that go through your options as you set it up. Plus, many of the WordPress themes promote their ability to integrate with BBPress as a feature, so you’re sure to get the website you want. With your account, you can oversee all of the activity in one place. Having this plugin over the full social networking plugins is a lot easier to manage. You won’t get all of the features of the others, but it’ll certainly add to your users’ experience. Have you created a social network for your business, community, or niche before? If so, what tool(s) did you use? I’d love to hear about your process in the comments!